Curries can look really intimidating to make. They always have these huge ingredients lists and the flavours are always so complex and delicious that it just feels like a lot. Ya know? Well. Difficult, this is not. 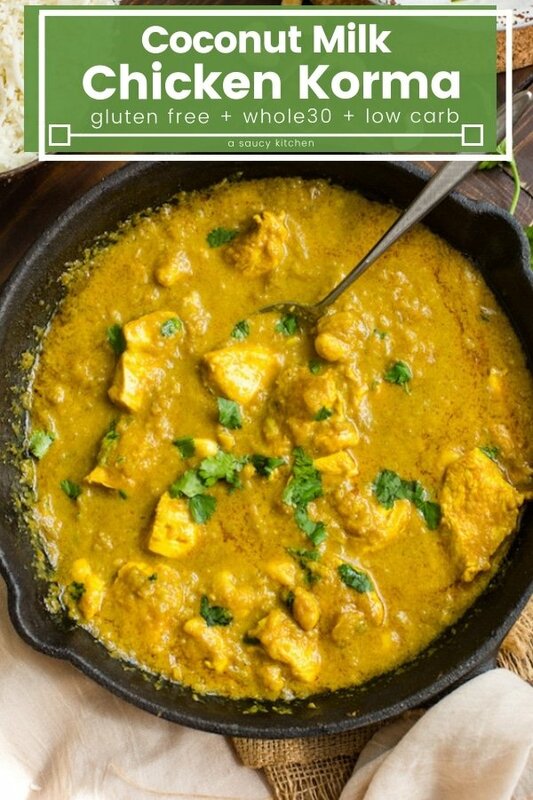 Glancing briefly at the ingredients and instructions here this chicken korma with coconut milk might look like a lot it’s actually a pretty easy, straight forward curry that takes about 30 minutes to make with ingredients that you probably already have in your kitchen. Personally, the most challenging thing about making this is chopping the onions. I am a total wimp when it comes to onions. Just standing over a hot pan full of onions is enough to make my eyes burn but it’s so worth it in the end. Altogether this curry can be made in about 30 minutes. It’s made almost entirely in one pan, though you will need a blender or even a small food processor as well. Start off by simply frying up your cubed chicken in coconut oil. Cook for about five minutes and then remove the chicken from the pan and set aside. It’s alright if the chicken isn’t 100% cooked through at this stage because you will be adding it back to your dish later. Moving on: it’s time to pull out the blender. We’re basically going to be making out own ginger/garlic/onion paste by blending them all up with a little water until smooth and watery. Normally in curries like these you’d be asked to use a pre made or pre bought paste, but we’re just going to make it because it’s faster, easier and cheaper. Note: This recipe calls for two onions. One onion (the roughly chopped one) will be blended along with the garlic and ginger while the other is chopped and fried separately. In the same pan you used to cook the chicken, heat the remaining coconut oil and begin frying your remaining onion. Cook for about 10 minutes until it’s soft and slightly browned. Add the spices and onion puree and cook for about a minute. Stir in the coconut milk and chicken stock and let that mixture simmer and reduce into a nice, thick, golden-brown sauce. At this point all you need to do is add in the chicken and cashews and cook another 5 minutes until the chicken is cooked and piping hot. Top it off with some fresh cilantro and serve! This chicken korma with coconut milk is a great option for people who are sensitive to spicy foods. It’s a pretty mild curry with only 1/2 teaspoon chilli powder. You can also reduce that amount down even more to 1/4 teaspoon if you really want to play it safe. If you’re looking for a Whole30/low carb meal, serve this over warmed cauliflower rice and you’re all set! Otherwise a side of gluten free flatbread or naan and regular rice is also a great option! 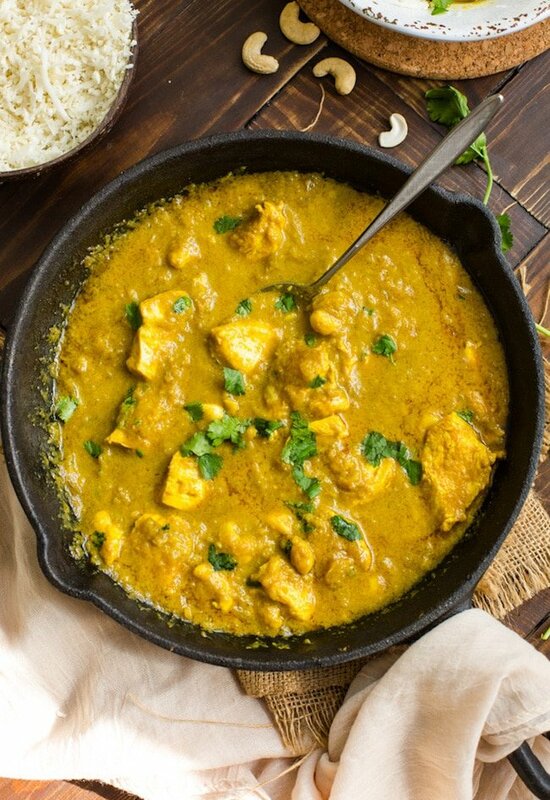 Don’t forget to #asaucykitchen on instagram if you this Chicken Korma with Coconut Milk! I love seeing what you make! You can also post your pictures to my facebook page! Stir in the onion, garlic & ginger puree along with the cumin, coriander, turmeric garam masala and chili powder. Cook 1 minute. Nut Alternatives: You can replace the cashews with flaked almonds or another nut of choice or omit them altogether. Coconut Milk: I recommend using a full fat coconut milk from a can as opposed to reduced fat or carton milk. The extra fat will yield a creamier curry. You can also just use straight coconut cream or regular dairy cream if you can tolerate dairy/don't need this to be Whole30 compliant. Decided to make this for my weekly lunch meal prep. It did not disappoint! 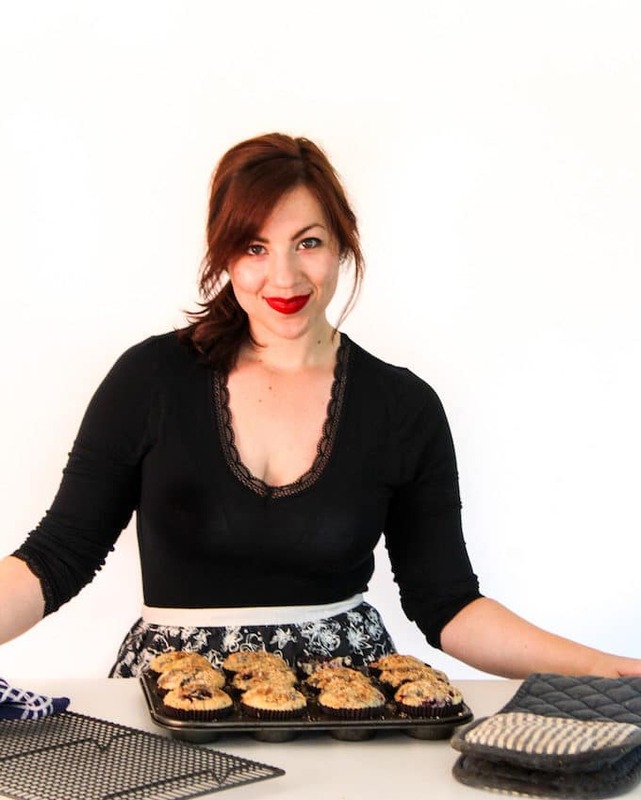 Very easy to make and super delicious! Thanks CarrieAnne! Glad you liked it! Thanks Natalie! Glad you liked it!